Google’s latest Android phone operating system has revealed a feature that will scan for networks and track user’s locations even when Wi-Fi has been turned off. By identifying nearby Wi-Fi networks a device can determine a user’s location and it can be used as an alternative to GPS. HOW DOES GOOGLE USE WI-FI TO TRACK LOCATIONS? According to the official Google support pages: ‘To improve your use of location-based services, Google, as a location service provider, uses publicly broadcast Wi-Fi data from wireless access points, as well as GPS and cell tower data. Location services play an important part in enabling many of today’s most popular location-aware applications. The inclusion of your WiFi access point in the Google Location Service enables applications like Google Maps to work better and more accurately. This can be disabled but involves changing the name, also known as the SSID, or a wireless network. To do this add ‘_nomap’ to the end of the SSID. 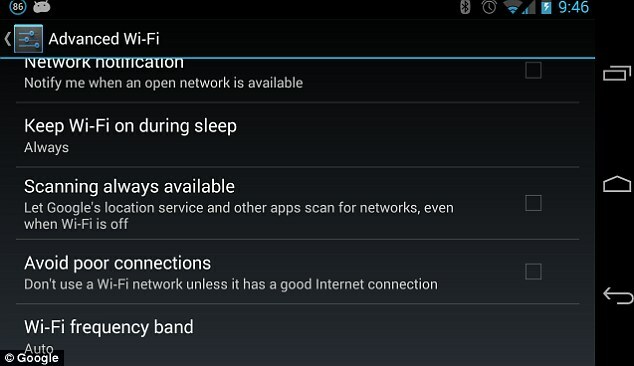 The new feature of Android 4.3 means that even if a user disables Wi-Fi to save battery or conceal their location, for example, it will stay on and run in the background. It also indicates that any location, or ‘other’ information obtained during this scan will be shared with Google or other apps installed onto a device. Google is yet to comment on what these ‘other purposes’ could be. According to Ron Amadeo from fan site Android Police, who discovered the code: ‘Google wants you to leave your Wi-Fi on, or at least partially on, all the time. ‘Now I know you might immediately scream ‘MY BATTERY [LIFE!’] but this will probably save battery. The feature is turned off by default, according to users who have already downloaded the update. Plus it can be enabled or disabled by going to Settings, Wi-Fi, Advanced Wi-Fi and checking, or unchecking, the ‘Scanning always available’ box. Google rolled out its Android 4.3 Jelly Bean Over-The-Air (OTA) update for Google editions of the HTC One and Samsung Galaxy S4 handsets earlier this week. The update to the operating system was announced in July during the launch of Google’s 2013 Nexus 7 tablet. It was first ported to older Nexus devices including Galaxy Nexus, Nexus 4, Nexus 7 and Nexus 10. 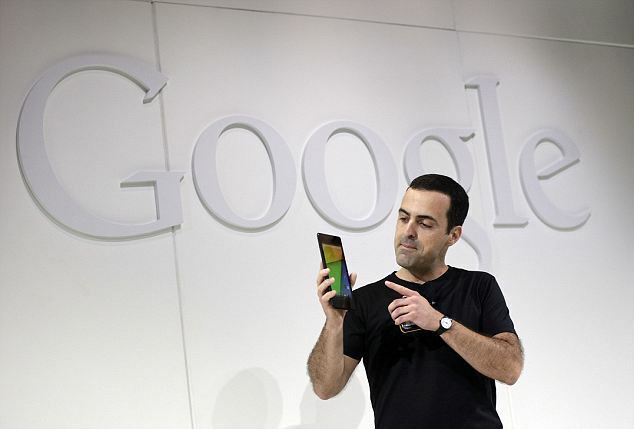 Google has introduced other features to Android 4.3 to increase privacy and security. Its added support for encrypted KeyChains that let people store private information that remains hidden even if hackers break into the phone. It has also moved the Verify Apps feature that scans any downloaded apps automatically for malware to the Google Play Services menu and added a ‘Find My Phone’ feature, if the handset is lost or stolen. Other features include customisable multi-user accounts, restricted profiles, an advanced camera app and a new keyboard. Android 4.3 has also added support for Bluetooth smart technology, also known as Bluetooth low energy. This means apps can connect to the low-power sensors used in fitness technology for example.